Why Do I Sneeze After I Eat? How to Deal with Sneezing After Eating? Sneezing is the natural reaction of the body to any irritation in the upper respiratory tract, particularly nose. If sneezing occurs regularly after eating a meal, you may wonder how something present in the stomach can cause irritation of your nose. Consuming large meals or certain kinds of foods can result in nasal irritation. Read on to learn about the reasons of why sneezing occurs after eating a meal and what can be done to relieve it. One of the most common causes of sneezing after eating is allergy to foods. Many people develop sneezing after consuming wheat, peanuts, chocolate, milk, eggs and seafood as their bodies are highly sensitive to these foods. An immune response is triggered in the body when an individual consumes these foods, which results in a sequence of symptoms generally starting with sneezing. Sneezing may occur if you eat excessive amount of food, the cause of which may be distended stomach. Eating beyond the capacity of the stomach stretches its walls. This results in irritation of nerves present in the mucosa lining the stomach causing fits of sneezing post eating. This particular condition is referred to as Snatiation and is genetically linked. Individuals who have this trait have incessant sneezing when their stomach signals the brain that it’s full. The sneezing due to overeating does not depend upon the kind of food consumed. You can control it by avoiding heavy food, consuming frequent meals and eating small portions. Why do I sneeze after I eat? The cause of sneezing after eating may be environmental allergies, causing allergic rhinitis. What is the meaning of this? It implies that allergic reactions may occur due to particles floating in the air. Sneezing attacks may occur due to being in an environment with perfumes, pollen, and smoke, fur of pets, dust and detergents. Sometimes sneezing post eating may occur due to these triggers of allergies. You may develop more severe symptoms than just symptom of sneezing. To prevent this situation, you are required to study the environment in which you live and find out a common trigger factor of your sneezing after you eat. It is a type of rhinitis that is non-allergic in nature and results in congestion of nose, running nose and continuous sneezing after meals. Gustatory rhinitis generally occurs as a result of eating certain foods such as ice creams, spicy foods, alcohol and cold drinks as a reaction in nervous system is triggered by these foods that leads to swelling of nasal mucous membrane. 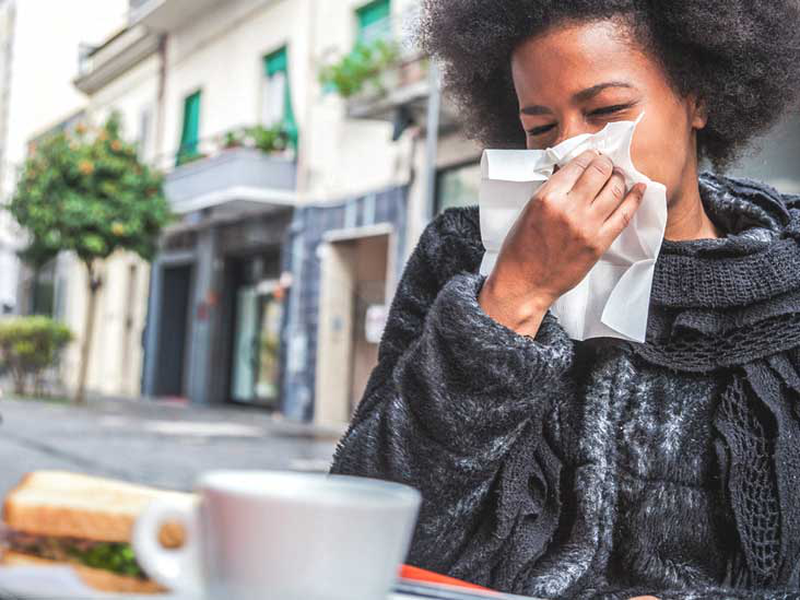 A survey reports that individuals who smoke or who have allergic rhinitis are more prone to develop symptoms of gustatory rhinitis. Different types of medicines are available. Nasal decongestants: These medicines clear the sinuses and nose of the stuffiness. However, you should not use them for greater than five days as they may cause nasal congestion. You should not use them excessively as they have the ability to result in rebound congestion. Antihistamines. They work if sneezing is caused by allergic reactions. They are available as tablets, syrups or nasal sprays. They dry the secretions in nasal passages and provide relief. Regularly blow your nose: This assists in clearing the nasal passages of mucus or congestion. Take care of the dining area: You should clear the environment you live in of the possible allergens. Ask your companion with whom you are dining to not wear a perfume. You should also take care to clean the area of furs of pets and other triggers. Take steam: Use steam from hot shower or humidifier. This helps in breaking mucus in nose and improving congestion in sinuses. Saline nasal spray: Saline nasal sprays available commercially help by flushing the irritants out from nasal passage. They also provide moisture to soothe nasal passages and prevent any further irritation. Nasal lavage: Nasal lavage involves irrigating the nose using devices such as bulb syringe, neti pot or squeeze bottle. Sterile or distilled water is used in these devices to flush out the irritants from nasal passage. It is very helpful to use nasal lavage every day to overcome sneezing post eating. Drink lots of fluids: Drinking lots of fluids helps to keep your body hydrated and also reduce the dryness of mucous membranes. This minimizes irritation of nasal passages and prevents episodes of sneezing after eating. Avoid consuming heavy meals if your symptoms are due to distension of stomach. Instead, consume small meals frequently throughout the day to prevent having a full stomach. This will control your sneezing. If your sneezing is caused due to hot temperature of body, it can be stopped by sucking on ice cubes or drinking icy cold water. In genetically predisposed people, their temperature of body increases after consuming hot meals. However, drinking icy cold water cools down the temperature and stops sneezing. Individuals who have sneezing post eating due to food allergy often do not have symptoms after every meal. Hence, in case you have occasional bouts of sneezing, that is, on exposure to allergens, then most likely your sneezing is due to allergy. In this case, you should maintain a food diary and note down the foods you consume. By doing this, you will be able to notice a pattern between the episodes of sneezing and the types of foods, cooking methods or ingredients, such as episodes of sneezing post eating nuts or bread. In this way, you can identify foods to which you are allergic. You can just avoid these allergens to prevent the episodes of sneezing.